One of the best features of the Apple Watch is that it sends notifications from your iPhone to your Watch, so you don't need to check your phone often. Forget having to pull out and unlock your phone to see your text messages or Twitter mentions, voicemails, or sports scores. 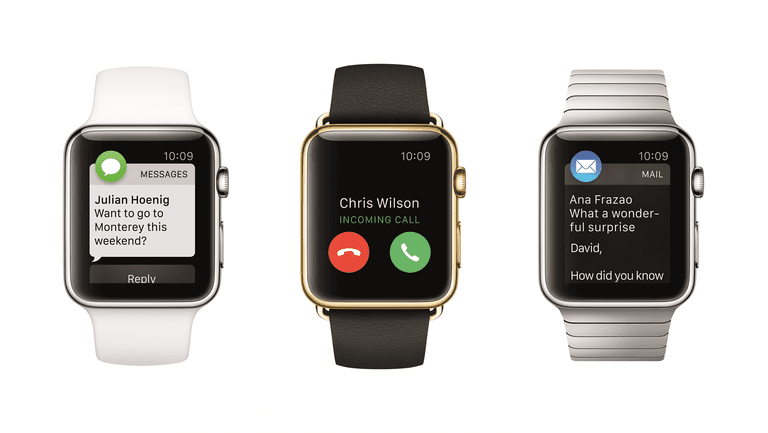 With the Apple Watch, all you need to do is glance at your wrist. Even better, the haptic feedback on the Apple Watch means you feel a vibration any time there's a notification to check. Otherwise, you can focus on whatever else you need to do. However, you may find notifications become too much of a good thing. If you have a lot of Apple Watch apps, you could find yourself overwhelmed by push notifications. Nobody wants their wrist to vibrate every time something happens on Twitter or Facebook, voicemail or texts arrive, there's breaking news, or updated scores in big games, when your Uber ride is approaching, or you're getting turn-by-turn directions. Getting that many notifications is distracting and annoying. The solution is to take control of your Watch's notification settings by choosing the apps you want notifications from and the kind of notifications you get. None of the steps required to manage notifications on your Apple Watch occur on the Watch itself. Instead, all notification settings are handled on the iPhone in the Watch app. Tap Notifications to display the two initial settings you need to select: Notifications Indicator and Notification Privacy. Turn on the Notifications Indicator by moving the slider to the On/green position. When enabled, it displays a small red dot at the top of the Watch screen when there are notifications. It's a helpful feature. Enable Notification Privacy by moving the slider to the On/green position if you're privacy conscious. By default, the Watch displays the full text of notifications. For example, if you receive a text message, you see the content of the message right away. With Notification Privacy enabled, you have to tap on the alert before any text is displayed. With the overall settings chosen, move on to controlling the notifications your iPhone sends to your Apple Watch from the built-in apps. These are the apps that come with the Watch, which you can't delete. Scroll to the first section of apps on the Notifications screen and tap on the one whose notification settings you want to change. For most apps, there are two settings options: Mirror my iPhone or Custom. Tap Mirror my iPhone, which is the default setting for all apps, to use the same notification settings as the app on your phone. For example, if you don't receive notifications for text messages or from Facebook on your phone, you won't get them on your Watch. Tap Custom to set different preferences for your Watch that differ from your phone preferences. The preferences depend on the app you select. Some, like Calendar, offer a number of settings, while others, such as Photos, offer only a couple of choices. When you select Custom, you need to make additional choices. Tap Notifications in the top left corner of the screen after you pick the settings for each built-in app to go back to the main Notifications screen. Scroll down to the last section of the Watch app Notifications screen to see the third-party apps installed on your iPhone that have Apple Watch components. The choices here are simple: Mirror your iPhone’s notification settings on the watch or get no notifications on the watch at all. Move the slider to the On/green position if you want to receive notifications on your Apple Watch mirrored from the iPhone. Move the slider next to an app to the Off/white position to prevent all notifications from that app from appearing on the watch.